Concept garage | USHIO INC.
We introduce new technologies and products developed for "light solutions" that support next-generation technology innovation and pave new roads to use and application of light. Ushio is also looking for partner companies and research institutes for collaboration of development of such product and technology applications. * Some of the newly developed products listed here are available for loan or trial use on-site at Ushio’s facilities. Please feel free to inquire. This optical measuring instrument (microscope) is a type of interferometer based on the principle of digital holography that captures high-speed 3-D images at 0.05 seconds/shot. 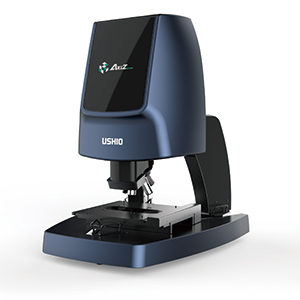 This new, unconventional type of microscope/measurement instrument can be used for whole-surface, overall inspection of fine, micron-level 3-D objects and for real-time fluid and shape behavior measurements. Products listed here are prototypes at the development level. They are not yet available as standard products, so please note the following. Since the products are development prototypes, they are only available in limited numbers. Please inquire with regard to availability of products in large quantities or regarding use for extended periods. Since these products are not yet being mass produced, they may not be available in stable supply. Further, some of these products may become unavailable due to changes in development plans. The specifications and properties listed are not assured. Further, they are subject to change without notice.